Trade has been a recurrent theme in both the Republican and Democratic presidential primary debates, with candidates in both parties repeatedly promising to be tougher on trade, especially with regard to China. Republican presidential candidate Donald Trump has promised to impose a 45% tariff on imports from China. Democratic presidential hopeful Hillary Clinton has pledged to crack down on Chinese currency manipulation that gives Chinese products an unfair competitive advantage. Americans agree that trade with China is an issue. While global trade ranks low overall on the public’s list of priorities – just 31% rate it as a top priority – 52% of Americans say the U.S. trade deficit with China is a very serious problem. Among the top five nations with which the U.S. runs a trade deficit, Germany has a $912 per capita trade advantage with the U.S. (total deficit divided by Germany’s total population), compared with China’s $266 per capita imbalance. This is largely because China’s large workforce churns out a high volume of low-value products for export to the U.S., while Germany’s smaller workforce largely produces high-value products, such as automobiles, to sell to Americans. Why should we look at the trade numbers this way? 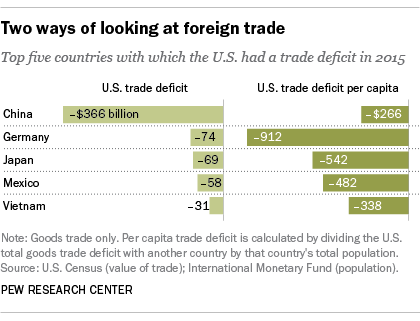 Because the composition of the U.S. trade deficit may say as much about the international competitive position of the United States as the trade figures we see in headlines. 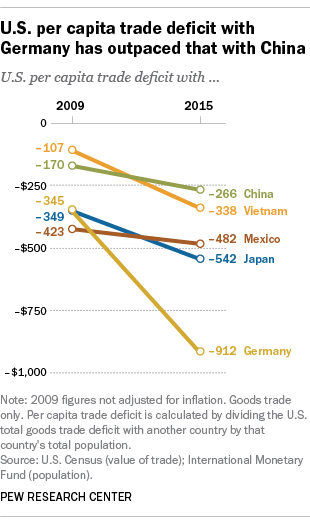 The U.S. per capita trade imbalance with both China and Germany has deepened since 2009, but Germany’s has done so faster. This growing competition from high-value-added products from Germany may be no less challenging in its own way than the competition posed by the far more numerous lower-value-added goods from China. And as China’s exports of high-value products to the U.S. increases – General Motors now intends to sell Chinese-made Buick SUVs in the U.S. in 2016, for example – the U.S. per capita trade imbalance with China may widen.